The Trump administration is on the brink of what could prove its most consequential legal battle with the state of California, with EPA chief Scott Pruitt expected this week to take aim at the autonomy that state leaders were given in the 1970 Clean Air Act to establish pollution standards for vehicles that are more far-reaching than the federal government’s. This autonomy is widely credited with the Golden State’s emergence as a world leader in environmental regulation. Last week saw confirmation of months of White House and EPA leaks that President Donald Trump would throw out a 2012 Obama administration edict that required average miles per gallon to nearly double to 54.5 for automakers’ fleets of new cars and trucks by 2025. Trump’s skepticism about climate change made him particularly open to the argument from General Motors, Ford and Chrysler that out-of-touch regulators under the previous president were trying to force them to sell vehicles that U.S. consumers didn’t want to buy. But as The New York Times reported over the weekend, Trump and Pruitt went further than automakers wanted both by rolling back mileage standards more than expected and by signalling their readiness for a court fight over the deference that federal regulators have traditionally shown to the California Air Resources Board. 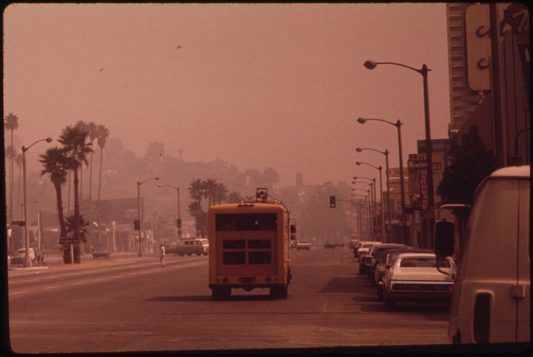 The Golden State’s problems with smog in the Los Angeles Basin – visible in the 1973 EPA photo shown above – led to the first state law in the U.S. targeting air pollution being adopted in 1947, among many other precedent-setting regulations. The air board continued California’s role as a pioneer in setting vehicle emission standards after it was launched in 1968 under then-Gov. Ronald Reagan. Its vehicle emission and safety rules often end up being copied by Congress and federal regulators and by nations around the world. The state’s present rules are followed by 12 other states, including New York and Pennsylvania – meaning the Golden State dictates what automakers must provide in about one-third of all new cars sold in the U.S. each year. But with California’s pollution problems beginning to look more like the rest of the nation’s in recent decades, Republicans have increasingly chafed at the idea that CARB and not the EPA should have the dominant policy-making role on vehicle fuel and emissions standards. “California is written into the Clean Air Act by name: At any time, it can ask the EPA administrator for a waiver to restrict tailpipe pollution more stringently than the federal government. If its proposed rules are ‘at least as protective of public health and welfare’ as the EPA’s, then the administrator must grant the waiver. The administration of President George W. Bush became the first to challenge California’s special status when it rejected the state’s request to expand its definition of what substances in the atmosphere it could regulate to include non-polluting greenhouse gases. That prompted the filing of a lawsuit in January 2008 by then-Attorney General Jerry Brown that was backed by Gov. Arnold Schwarzenegger. But it became moot after Barack Obama succeeded Bush in the White House and the EPA resumed treating California’s proposals with deference. Over the past 14 months, California Attorney General Xavier Becerra has filed 28 lawsuits against the Trump administration, according to a tally kept by the Washington Post. But even before Becerra began his litigation, Gov. Brown anticipated the upcoming CARB-EPA fight and emphasized its importance. In comments made in December 2016 – a month after Trump’s election – Brown framed the dispute as having consequences for the “survivability of our world” because of the threat posed by global warming.